A sewer at Lansing’s Peckham Industries. Peckham is part of an effort to grow Michigan’s apparel and fashion sector. Several Lansing participants are playing key roles in the effort. WKAR’s Mark Bashore explains. 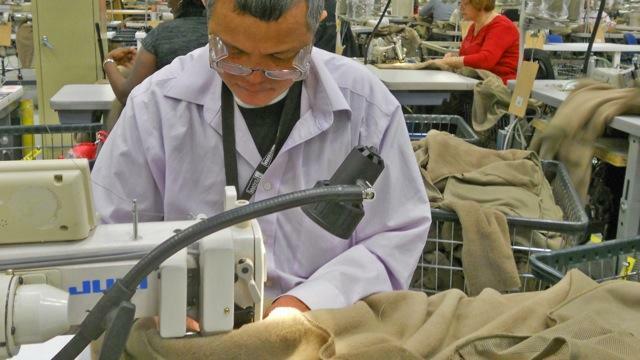 On the sprawling, 115,000 square-foot production floor at Lansing’s Peckham Industries, sewers run machines that piece together fleece jackets for the U.S. Army. Creating military apparel is Peckham’s bread and butter. Ed Terris is the firm’s Director of Manufacturing. “This jacket we produce approximately about 50 thousand garments per month, and these jackets are primarily going to go to the troops in Afghanistan,” he says. But the Lansing company recently joined an effort that’s far removed from the military. Peckham is one of dozens of enterprises on the newly-created Michigan Garment Industry Council. Prima Civitas thinks the state has the components of a potent garment and fashion sector. Peckham CEO Mitch Tomlinson says even a maker of Army outerwear bound for Afghanistan has a role to play. Peckham isn’t the only Lansing participant. Not four miles away near downtown, Rebecca Clark owns and operates two fashion start-ups: Northcoast Design Group and Michigan Fashion Proto. The graduate of Lansing Community College and New York’s respected Pratt Institute spent 13 years climbing the fashion ladder in the Big Apple with the likes of Vera Wang. Back in New York on business for Northcoast’s new ‘Trybe’ label, the Lansing native says she always wanted to put what she’s learned to work in Michigan. She says a nascent fashion sector is taking shape. Clark mentions Detroit-based rising stars Fotoula Lambros and William Malcom. She’s hopeful that connecting the various facets of the industry—designers, manufacturers, wholesale, retail—will soup-up the sector and raise its profile. Council members feel activity in the Detroit area will likely be the hub of growth. Prima Civitas’ Eleanor Fuchs says it helps that the city’s enjoying an influx of creative young people. Admittedly, affordable rents are also luring young creative people to Motown. Still, Fuchs is convinced that this crowd’s passion burns hotter due largely to an idealistic drive to help Michigan. Joe Faris may be the best-known member of the Michigan Garment Council. The Troy-based design standout was featured in the fifth season on the Bravo cable hit ‘Project Runway.’ He calls himself an ‘expat’ after 25-years working in New York, including a stint at Ralph Lauren. Faris says transferring some of the state’s auto manufacturing prowess to apparel could pay big dividends. Faris and others also feel that worldwide awareness of the city’s heritage and challenges begs creation a new a clothing line that unashamedly bears a Detroit brand. In the meantime, some of these passionate ‘ex-pats’ are briefly leaving town again. They’ve accepted an invitation to the Istanbul Fashion Show next week. They hope to show their hosts that Detroit--and Michigan—is about more than just beautiful cars.